Some fifteen years after its inception in France during the 1870s, Impressionism gained widespread public recognition in America and remained enormously popular well into the 1920s. As a founding member in 1897 of The Ten American Painters, a group that included this country's most talented Impressionists, Benson enjoyed considerable national stature. His reputation also rested firm as a leader of the so-called Boston School, a circle of regional painters specializing in figural subjects posed in idealized interiors and outdoor settings. Benson's wife, three daughters, and son were his favorite subjects, and the artist's affection for his family pervades the likenesses he made of them. 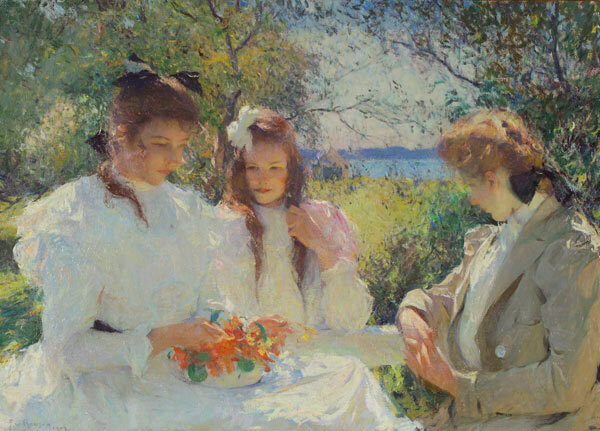 In this canvas (left to right) Elizabeth, Sylvia, and Eleanor are captured in quiet repose against a sun-filled vista at Wooster Farm, which Benson purchased in 1901 as a summer place on an island off the coast of Maine: North Haven in Penobscot Bay. Such idyllic compositions allowed the artist to combine an interest in the figure and a preference for plein air, or outdoor, painting. Although the style of this oil derives from the bright, high-keyed palette and energetic brushwork of the French Impressionists, the solidity of the figures reflects the lingering influence of Benson's early training with academic painters.